India as of now was an emerging market as far as the automobile scene was considered however after the recent influx of ultra luxury cars, some costing more than Rs 20 crores, suddenly the Indian market is on a boom. Not only are Indian millionaires on a spending spree but they are also going in for more exclusive models, something which isn’t taken by the others of their ilk. All the more customers seem to be plonking in right for the high end sports cars. Well, today I have got two cars pitted against each other, not sports cars but hatchbacks. Though both have never being compared against each other in the Indian market, across the globe, they are competitors. So why not in India? Because neither of the cars have sold in great numbers here and neither have the respective manufacturers attempted to publicize them. The reason being that these are brought down to India in the Completely Built Unit or CBU form and then sold. They are just there for a brand boosting exercise. But both the cars, the Fiat 500 in India in a red color and Volkswagen Beetle in India in yellow color is a sight which no one would want to miss. Almost both fall in the same price bracket. I would stress on the word ALMOST. Fiat 500 – In the looks department, it’s a personal choice but then I feel that the Fiat 500 looks more cute and at the same time in an Abarth trim ferocious. Check out the short snout and those round head lamps. Those and the parking lamps just below do make an aesthetic design. One thing is for sure that both the cars haven’t deviated much from their original designs and we are talking something which was conceptualized in the mid 40s. The chrome bar at the front along with the wide air dams and those small fog lamps make for quite a style statement. I have heard that the longer it is, the more desirable it is. Hmmm… coming back to the topic and that is this car measures only 3.25 meters and is very desirable. The 16 inch Spyder alloys look perfect on this car however there is an option for Yamaha like tuning fork alloys. The rear features tail lamps enclosed in chrome. There is a chrome bar even at the rear to liven up things. A single chrome tipped tail pipe peeps out from the lower bumper. 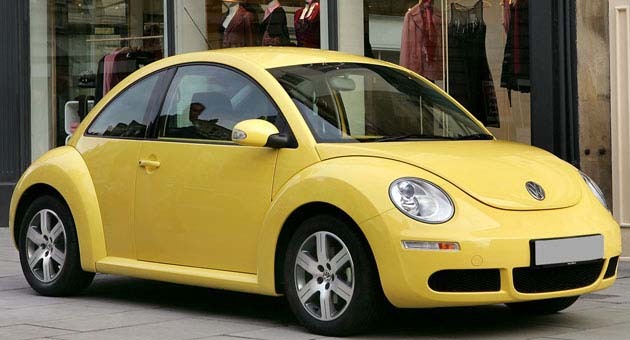 Volkswagen Beetle – The Volkswagen Beetle in India has got a curvaceous snout and it has also got oval head lamps. The Beetle has evolved over the years so much so that even though the form is recognizable mainly due to the headlamps, the rest of the body of the car doesn’t quite agree. The 15 inch tyres don’t quite look modern and I initially had reservations if they were actually alloys but then the egg shell curvature blending smoothly into the small boot looks perfect for a retro car. The rear end features a wider windscreen and has got an all integrated oval LED tail lights with reflectors and a mesh in the rear which projects the image that this car is rear engined, which it is not. Typical German, the tail pipe missing from view. The stop lamp is mounted on the boot lid though. Out of the two, it’s a tough fight as to who wins the beauty contest. Tough one and with certain permutation combinations, it would be the Fiat 500 which seems to have stuck a bit more to its primary roots rather than the Beetle and hence wins this round. 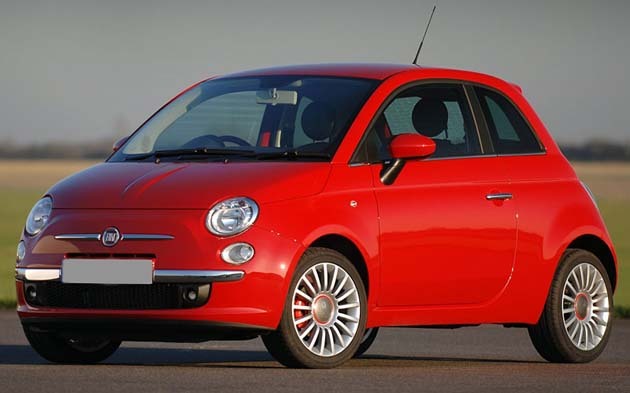 Fiat 500 – The Fiat 500 in India by being virtue of a CBU gets exactly the same features as its Italian counterparts. However still some features like the navigation system have been deleted. Well, who needs navigation systems here in India? Mixture of gray and white adorns the entire cabin. The white plastic used however tends to soil easily and would be a pain to clean. Even the fonts for the buttons are in white so this is something which takes some time getting used to. Build quality is typical Fiat minus the quirky plastics. Infact the dashboard plastics feel better than they are even in the Fiat Linea. The speedometer is a big unit however like the white fonts, it is bit difficult to read while on the move. The seats are comfortable but then if you are 6 feet plus, then it is better that you avoid this car. The standard music player has got an aux input to it. Rear seat space is better left for kids and by that, I mean it. Boot space with the non splitting seats stands at 185 liters. Volkswagen Beetle – The Volkswagen Beetle is one familiar car. After all, you get that typical German feel once you enter the cabin. 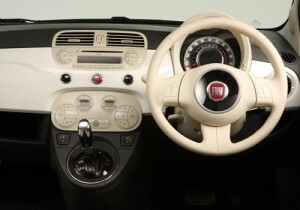 However the build quality isn’t in the same league as the Fiat and infact feels a notch down. The Beetle I had for this comparison was an old one and hence the build quality was notably down. I had checked out the new lot Beetle at the Surat Show and found out that build quality was typical Volkswagen and all the panels seem well put together. Seems like the earlier models had a problem of lower build quality. Thankfully the flower vase has been removed from the dashboard design. Feature list is thankfully not pathetic with cruise control, climate control with dual zone properties, keyless entry as also the parking sensors. The meter dials look wonderful while easing into the driver’s seat is a bit more easier than in the 500. Moreover, the Volkswagen Beetle has got a very much usable rear seat. Our photographer could easily manage to find room at the rear and he tips the scales at 74 kgs and measures 5foot 7 from head to toe. Boot space is also slightly more than the Fiat at 213 liters. The Volkswagen Beetle wins this bout due to the fact that it has got more space and features than the 500 though, the interiors are hard wearing, they seem to lack the build quality feel of the 500. Check out new lot of Beetles though and they would have better build quality. Fiat 500 – The Fiat 500 rides on harder springs and Fiat have done precious little to fine tune this car for the Indian market. Ride quality is similar to BMW cars and though I might be exaggerating here, it is not at all comfortable. Just ignore long distance runs on this car is what I would suggest. All this stiff ride quality however does mean that the Fiat 500 is an enthusiastic handler. It takes to corners like a dog takes to a bone. However there is a limit to what you can do with a tall hatchback. Push her hard around a corner and she rolls a fair bit but a quick steering input wouldn’t faze her much. The steering is light but noticeably weightens up once the speeds rise. The turning circle in typical Fiat fashion is a bit more than what can be expected out of a small car. NVH levels from the multijet are kept at a fair clip however pushing it hard does reveal its roots –diesel. Volkswagen Beetle – The Volkswagen Beetle in India has a far better ride than the Fiat 500. If the Fiat 500 felt like a stone, the Beetle is soft Basalt. Typical of small wheelbase cars, even this one feels nimble around town but on the highway, its stance gets a bit ruffled. The steering wheel feels disinterested in the proceedings and is lifeless. Handling is okay but not as good as the Fiat 500. NVH levels, even though this car is a petrol, is a bit on the higher side as compared with the Fiat 500. Take a corner at a fair clip of pace and the Beetle protests. Tough one – ride quality or handling. I will take ride quality any day and so it would be the Volkswagen. Fiat 500 – Fiat have launched the 500 in India with a single engine option and that is the universally used 1.3 liter multijet. This engine is in the same tune as it is in other small hatchbacks. It makes 75 Bhp of power with 145 Nm of torque coming in as low as 1500 rpm. Transmission duties are handled by a 5 speed manual gearbox. The car felt anything but sluggish and turbo lag was almost non existent. The 500 completes the 0-100 lap timing in only under 12.4 seconds. This car however chickens out at 154 kmph top speed. Discs in the front and drums at the rear ensure that this car stops well within the safety limit. Moreover, it also has got electronic aids intervening in the form of ABS and EBD. Safety also is taken care by twin airbags, seat belts, FPS and also a steering column which is collapsible. Fuel efficiency though not in the same league as other applications of the multijet, is fairly good at an overall 16.2 kmpl. 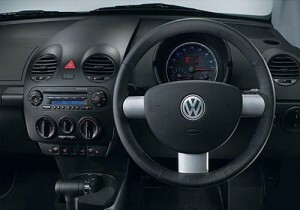 Volkswagen Beetle – Volkswagen have offered the Beetle here with only a 2.0 liter petrol engine. Nah, there is no TSI or TFSI matron running inside the engine. This engine makes 115 Bhp of power and 172 Nm of torque. It is aligned to a 6 speed automatic box. The Beetle’s engine doesn’t seem too eager to rev and even the gearbox was a bit of a dampener with its reluctance to downshift when wanted. However when the car was timed for the 0-100 drag, it turned out to be faster than the 500 with times of 11.5 seconds. The top speed that I could manage to drag it to was also higher than the 500 at 177 kmph. The engine however sounds very unrefined by then. But then Volkswagen have given the Beetle better equipment levels and those include the likes of all wheel disc brakes, stability control, EBD and ABS. Needless to say, stopping times were better than those of the 500. Safety aspect has been covered in the form of 4 air bags, collapsible steering wheel and seat belts with pretensioners. However fuel efficiency is lower than that of the 500 at an overall 11.7 kmpl. The Fiat 500 wins this round. Even though they might have a price difference, both the cars have been brought into India for the sole purpose of brand building exercise. Many would argue that neither Fiat nor Volkswagen need any introduction in India but then take into factor the brand bashing which both have received in India and noticeably for their aftersales. Fiat have handed over their aftersales reign to Tata Motors and somehow the sales and service part seems to be going on smoothly. For Volkswagen, there has been a widespread criticism regarding their aftersales and day by day, its increasing. For the pros and cons, both the cars seem evenly matched. While the 500 gives thrills with its handling capabilities, the Beetle gives a good ride quality. While the build quality of the Beetle may be questionable, the boot space in the 500 is on the lower side. While the Fiat with its lower capacity diesel engine manages to thrill, the Volkswagen’s engine can hold onto higher speeds easily. Frankly speaking, I wouldn’t want to buy any of these. However for all its convenience, it would be the Volkswagen Beetle in India which comes out the winner. But convenience is at a price and the Volkswagen Beetle price in India is Rs 25 lakhs. This is the on-road price in Mumbai. The Fiat 500 price in India for the top end model is Rs 16.4 lakhs, on road, Mumbai. A difference of almost Rs 10 lakhs. Take your pick from amongst these two. Volkswagen have revealed teasers of a new Beetle which might make it to the Indian shores and would stress more on the comfort factor.